I forget things. It happens all the time. It always has, and it probably always will. I tell you this because I like you, and I want you to know that my intentions are always good, and I am not careless or lazy. I just forget things. This evening, I finished work, packed up my things, and strolled home. I love Thursday nights; that’s when I look back on my week and reflect. Tonight I thought: This life is pretty good. Work is pretty good. Dinner is always good. I’m thinking this as I walk up to my front door, reach for my keys, and realize they aren’t there. They aren’t there because they’re still at work, hanging in the supply closet that I forgot to lock. In problem-solving mode, I walked to my car to drive back to work, only to find that those parking tickets I’ve been putting off paying came to collect. There was a big, shiny, yellow boot on my front tire. Lovely. I text K to let him know that I have access to neither home nor vehicle, then called the number left on my car and speak to the kindest lady, who was right in the middle of helping me with the boot issue when my phone died. Everything was broken. Following his instincts that this was a situation in which I needed help, K shows up and saves the world. Again. He gives me a phone charger and a ride, which sometimes is all a girl needs. Or, this girl at least. So I forget things. It isn’t a quirk, it’s my personality. If I’m using up space in my brain for things like the weekend or what I’m having for dinner, I don’t have room for things like keys. And if I forget my keys, you better believe there will be a boot on my tire. And my phone will always die. Always. I remember what my 8th grade science teacher told me about Uranium, but on a Thursday night? My keys are getting left at work. It’s just the way I am. I’ll also forgot the kale in a Tomato and Kale soup. Whatever. 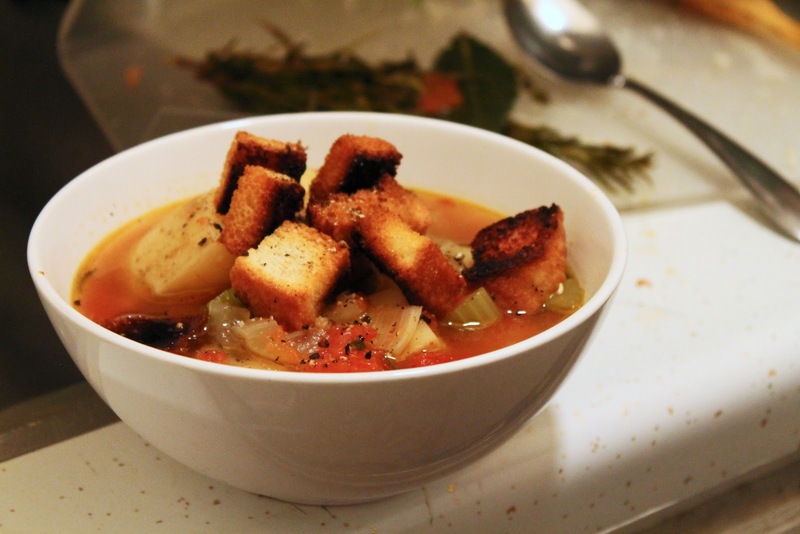 This soup, while missing a very key ingredient, was warm and comforting and delicious. I didn’t miss the kale, which is convenient considering I only remembered it after I had finished my meal. 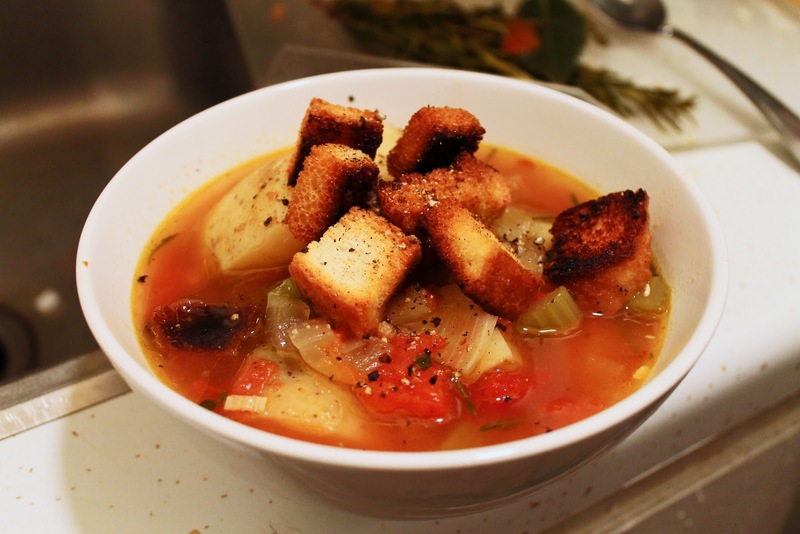 Serve in bowls with toasted croutons on top and more cracked black pepper. I’m not a huge fan tomato soup, but with the addition of the vegetables and potatoes, this felt more like a hearty vegetable soup than a tomato soup. The rosemary infused the entire soup with a wonderful flavor and the broth was one of the best I’ve ever tasted. And! It’s even better the second day! I wish I could remember basic, every day functions. Keys elude me. However, I don’t wish that I had remembered the kale. 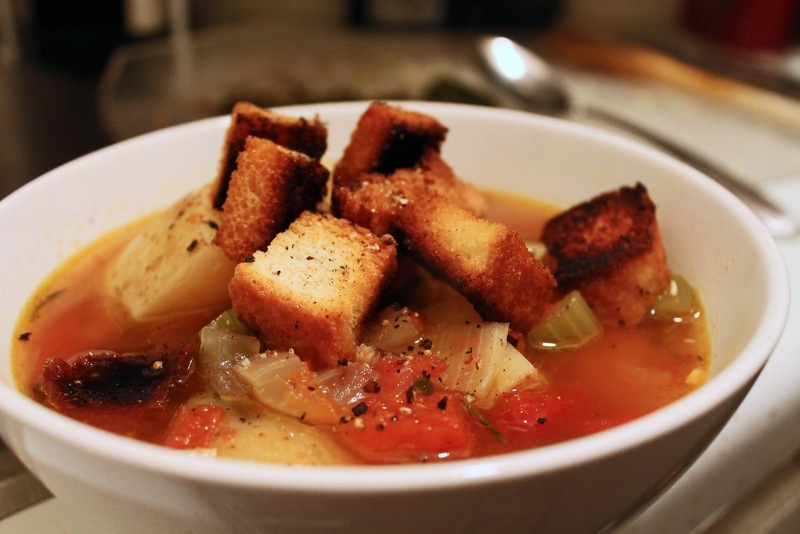 This soup was good, even if it was meant to be something different. And this night was good, even if it was meant to be something different (ahem, easier). That’s life, right? Well, It’s certainly my life. Preheat oven to 400 degrees. In a large pot, heat olive oil over medium heat and add onions and celery. Cook for 3 minutes, then add garlic and cook for 1 more minute. Add rosemary and thyme and pour in wine. Let cook for 5 minutes, until wine has reduced, then add potatoes, fire roasted tomatoes, and season with salt and pepper. Cover with chicken broth and water. 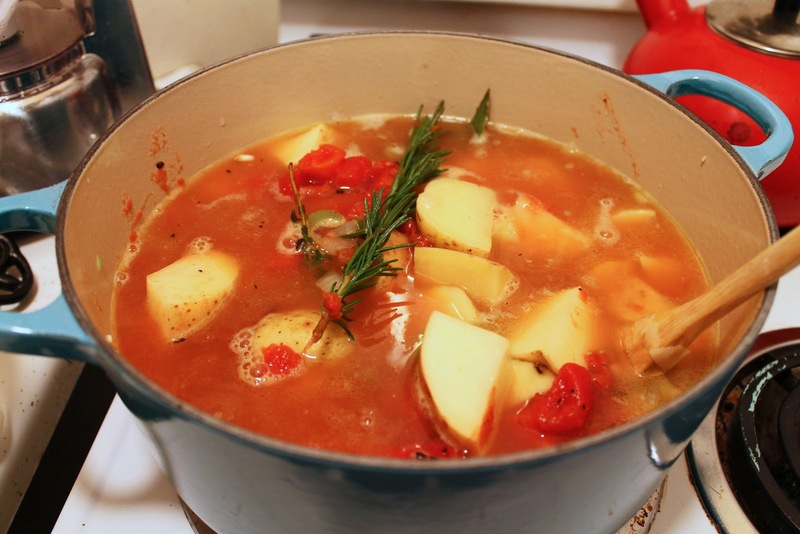 Bring to a boil then reduce heat to low and simmer for at least an hour, up to 3 hours. Meanwhile, cut bread into cubes. Spray a baking sheet with cooking spray then add bread. Season with salt and pepper and spray bread with cooking spray. Place in the oven for 5-10 minutes, watching closely so they don’t burn. Remove when croutons are golden brown. When potatoes are fork tender, taste for seasonings and adjust accordingly. Remove rosemary, thyme, and bay leaves. 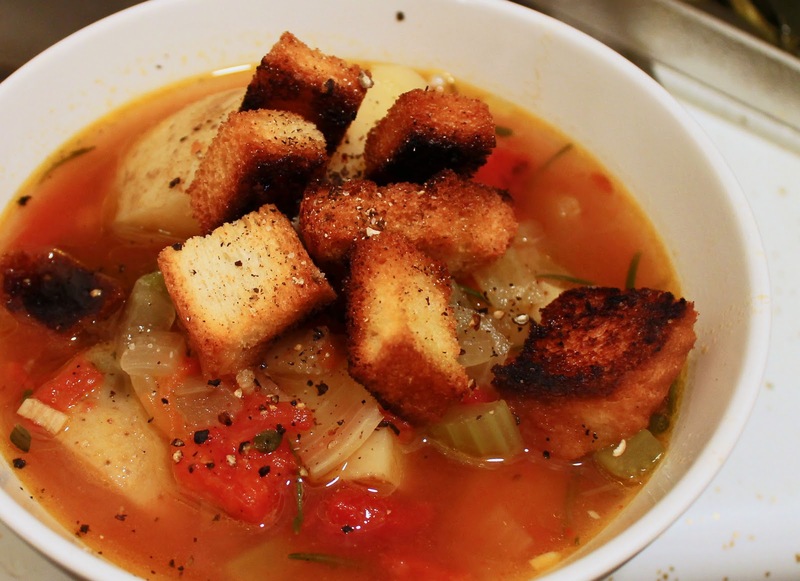 Serve in bowls with croutons and freshly cracked black pepper on top. Parmesan cheese would be divine also.